"We needed a new voice" says Andrews! 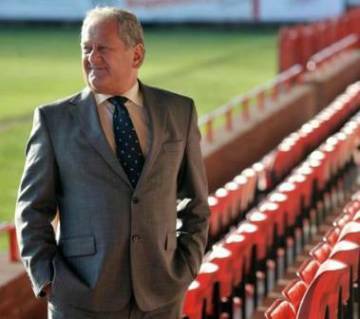 Focus on the first team, get results and take Tamworth back into the National North. The was the message Chairman Bob Andrews gave to Matt Panter of The Tamworth Herald when discussing the appointment of Dennis Greene as new first team manager at The Lamb. “We wanted to change the situation,” Andrews said. "We have promoted from within a lot before and we felt we wanted a new voice. There was a lot of interest in the position. It has been fantastic actually. We had a lot of different people, who wanted the chance to come here because of the size of club and our reputation." Andrews continued “But as someone with the experience Dennis has got, I feel it’s a good move for us. He is someone who can offer a new line of thought and is hungry for a new challenge. Dennis is a good character and I think he is someone who will want a bit of banter as well. We feel he can be a good motivator.". Commenting on Dennis Greene's previous managerial positions, Andrews said “Whenever we have come up against Boston in the past, they have been a big, strong side. We feel that with this league, that’s where we need to go. We need players who are prepared to stand up and be counted. I want us to make this place, The Lamb, back into a fortress where other teams don’t want to come and play. For the last couple of years I think it’s been too easy here for opposing teams."